Determination of total water hardness with express test is simple and reliable. Total hardness test assesses the level of water scaling tendency and / or suitability for washing with detergents. For the analysis, take 5ml of test water with the test tube and add drop by drop of indicator until the red colored solution turns green. Caution! Read every drop! After every drop, test sample must be properly blended. The hardness is determined by the number of drops used. For example, 16 drops= 16GH hardness. 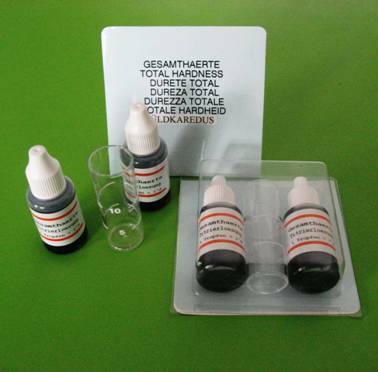 The analysis kit allows to determine the hardness by half German degrees of accuracy. For that, take 10 ml of water and then one indicator drop is equal to 0.5 GH. For example, 17 drops = 8.5 GH hardness.